September 26, 2014 • Yahoo decided to block mail from all customers of One.com, which happens to be my website hosting and mail provider. So if you want to send me a message, and expect an answer, please use any mail provider but Yahoo. • Based on some batch code I had to check, two more tests were added to BatCodeCheck.exe: a test for an excess number of delimiters in a FOR /F loop, and a test for wildcard characters in IF comparisons. Though both conditions are not always errors (you can use 16 delimiters, and you may check if a string contains a literal asterisk), it doesn't hurt to check and make sure. September 24, 2014 • BatCodeCheck.exe is a complete redesign and rewrite of BatHL.exe. Both tools check (validate) batch files for common mistakes, e.g. common typos, unterminated quotes, parenthesis and percent signs, undelayed variables while delayed variable expansion is active, etc. It is still in its early beta stage, but feel free to use and test it. would say MyVar IS defined when run on the command line, even though the variable was not defined at all. I should have mentioned (and as a matter of fact, I now have) that this test is intended for batch file use only. For some reason CMD.EXE interprets undefined variables as literals on the command line, and as plain undefined variables in batch files. • MessageBox.exe has been updated: an optional timeout has been added. September 23, 2014 • InputBox.exe has been updated: a new optional switch /T:seconds makes the dialog box time out after the specified interval. September 22, 2014 • A minor update for MessageBox.exe: it now also writes its help text to Standard Error, besides showing it in a MessageBox. September 16, 2014 • OpenFolderBox.exe has been updated: it now hides the "Make New Folder" button by default, with the new optional switch /MD the button can be displayed again, and command line parsing has been improved. September 12, 2014 • InputBox.exe has been updated again: a new optional switch /S inserts a "Show password" checkbox, and command line parsing has been improved. September 10, 2014 • InputBox.exe has been updated: it now accepts newlines in the prompt (\n), both window width and height can be set, and an optional command line switch /P masks the input text (for passwords). September 9, 2014 • DropDownBox.exe is a new batch tool to present a DropDown dialog and return the selected text on screen; like CHOICE with a GUI. September 7, 2014 • DateTimeBox.exe is a new batch tool to present a Date/Time Picker dialog and return the selected date/time in the specified output format. September 3, 2014 • A new version of PrinterSelectBox.exe is available. The original version used Windows' own Print dialog, the new version has a more "Spartan" interface without the bells and whistles that were of no use in the old version. On the command line you can specify the window title, the selected printer (full name or regular expression), and the dialog width. 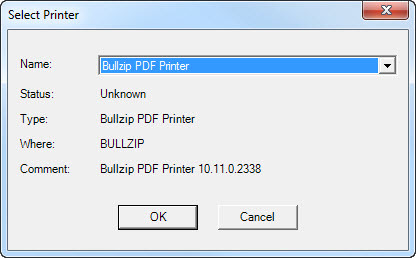 SET Options="Select a PDF printer" "PDF"
• I created a new page for all these new "Box" utilities: Neat Dialog Boxes in Batch Files. 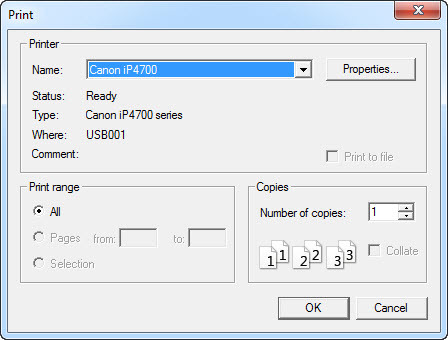 August 28, 2014 • PrinterSelectBox.exe is a new batch tool, written in C#, to present a Print (Printer Select) dialog and return the selected printer name. • OpenFolderBox.exe is a new batch tool, written in C#, to present a Browse Folders dialog and return the selected folder's full path. Note that the Browse Folders dialog also presents options to delete folders or create new folders. • SaveFileBox.exe presents a Save File dialog box, and returns the selected file path. • OpenFileBox.exe has been updated: if an invalid folder was specified, it would ignore the error and use the "last known good". The new version will abort and display an error message for invalid folders. August 26, 2014 • Next in line in our DialogBox series: OpenFileBox.exe. As the name suggests, it presents an Open File dialog box, and returns the selected file path. SET Options=D:\SourceFiles\Perl "Select a Perl file"
IF NOT "%PerlFile%"=="" ECHO You selected "%PerlFile%"
August 24, 2014 • InputBox.exe has been updated: it no longer displays the entered text on screen if "Cancel" is clicked. August 22, 2014 • InputBox.exe is a new batch tool, written in C#, to popup an InputBox from a batch file. The text from the input field is written to Standard Output (the screen) if the "OK" button is clicked. The optional command line arguments can be ignored if you don't need them, but you cannot just skip any argument and use the one following it. E.g. InputBox "Prompt" "Title" "Default value" 300 is correct, but InputBox "Prompt" 300 will use "300" for the title! SET Prompt=What is your name? Note that you cannot catch InputBox.exe's "errorlevel" with a simple IF NOT ERRORLEVEL 0 ... in the line following the FOR loop. Most of the C# code comes from Gorkem Gencay on StackOverflow.com. The new command line arguments can be ignored if you don't need them (in fact all arguments are optional), but you cannot just skip any argument and use the one following it. E.g. MessageBox "Message text" "Title" OKCancel Stop Button2 is valid, but MessageBox "Message text" "Title" OKCancel Button2 is not! SET Prompt=The operation failed.\nWhat do you want to do now? Note that you cannot catch MessageBox.exe's "errorlevel" with a simple IF NOT ERRORLEVEL 0 ... in the line following the FOR loop. August 20, 2014 • WMIGen.hta (the WMI Code Generator) has been updated: its improved update check allows you to automatically download and install future updates, and a setting has been added to change the HTA's style to black and white for better contrast (a matching command line switch /BW was added too). • Paste.exe has been updated: instead of having to redirect its Standard Output to a file, you can now specify the file name it has to write to (if not specified, it will write to Standard Output like it did before). • MessageBox.exe is a new batch tool I wrote to display messages in a MessageBox, like VBScript, with more options. I wrote it because displaying messages in a GUI has become harder: NET SEND has been discontinued entirely, and MSG.EXE is not available in Windows * Home Editions. August 8, 2014 • Several months after Windows 8 update KB2919355 failed with error 80070002 on my netbook, I finally found the cause. Or actually: Andrey Tarasevich did. I added his solution to my Tweaks page, it may prevent others from pulling out their hair. August 1, 2014 • For a friend I wrote MTUTest.bat, a simple batch file to check if the MTU setting for the (only) enabled network adapter is optimal or not. It is based on a tutorial by Harrison Fleetwood. July 24, 2014 • Mark Dekker found a logic error ("bug") in Which.vbs: it would iterate through the extensions listed in %PATHEXT% first, then through the folders listed in %PATH%, whereas the command processor iterates through the folders list first, and then through the extensions list. The new version correctly follows the command processor's "procedure". To implement this change I had to terminate the optional /L (return Latest version) switch, unfortunately. July 23, 2014 • Craig Burson found a bug in VBS2CMD.vbs: the generated batch file would often be saved in the parent folder of the VBScript file. The author of the script, Denis St-Pierre, intended the batch file to be saved in the same folder as the original VBScript. strFileNameOUT = objFSO.Buildpath( objFSO.GetParentFolderName( strFileNameIN ), objFSO.GetBaseName( strFileNameIN ) & "_CONVERTED.CMD" ) (line 77 in the current version). July 21, 2014 • Robert Cruz sent me a useful tip on escaping doublequotes in the search pattern of a FIND command: use double doublequotes. July 11, 2014 • David Brian Morgan found an error in UpdateCheck.ini: the ProgName and Win32Product values for File Commander/W were mixed up. Besides, a change in the version history on the SnagIt website necessitated a modification in the INI file. I also made a minor change in UpdateCheck.hta: if the latest version for a program cannot be determined, clicking the "Check" button will open the web page specified for the version check, instead of the download page. The updated HTA and INI files are now available for download. July 8, 2014 • UpdateCheck.hta has been thoroughly updated: new ways to check installed program versions have been added, new command line arguments allow "silent" runs without user interaction unless updates are found, and detailed Help and Reference pages have been added. And of course, while at it, I also added several new programs to the INI file.